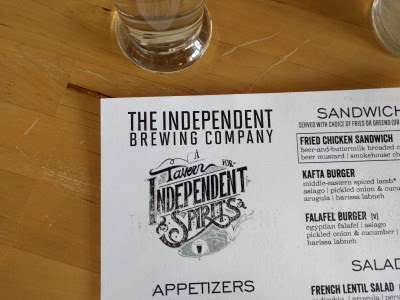 It's been well over a year since SP & I last went to The Independent Brewing Company in Squirrel Hill. Usually when we're in Squirrel Hill, we're both craving soup dumplings. But since last Saturday was a very hot & humid day, we didn't want steaming hot soup dumplings or steaming hot bowls of noodles no matter how delicious they are. So we decided to revisit this restaurant. We were seated right away (it was around 5:30 pm). It wasn't super crowded, but it was still noisier than I remembered. 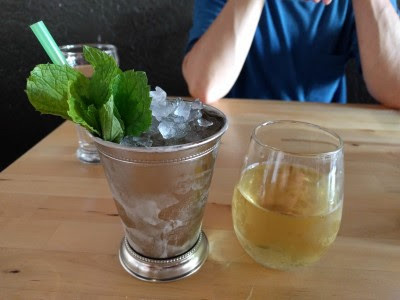 I really wanted iced tea, but they do not have fresh brewed iced tea (boo) so I ordered a Mint Julep. It was cold & refreshing, I just hadn't been much in the mood for booze. SP chose a cider. He got the last almost full serving so it was on the house. He later ordered a bourbon on the rocks to try. 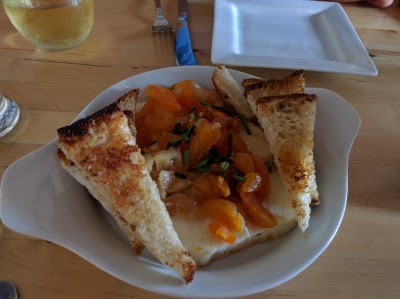 We started with an order of Rum-Fired Halloumi (Maggie's Farm spiced rum, dried apricot, caramelized onion, bread). I like this dish a lot. There are 3 good sized rectangles of the hard, salty cheese which is topped with the soft & sweet onions and the chewy fruit. The bread is lightly toasted but not too toasted. As delicious as I remember. 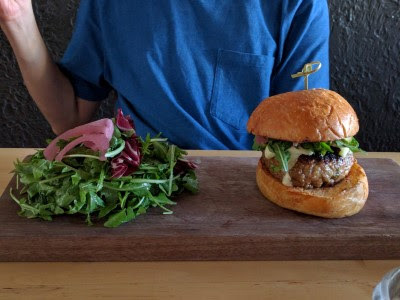 For his meal, SP chose Kafta Burger (Middle Eastern spiced lamb, asiago, pickled onion & cucumber, arugula, harissa labneh). He chose greens over fries as the accompaniment. He ate everything on the board, so I guess it was good. He said he really liked it. He never says much else when I ask him his thoughts for the blog! It didn't look like a huge burger but it was enough for him. 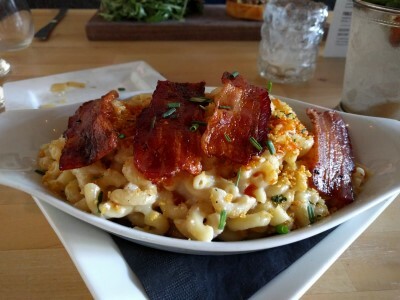 No surprise that I chose Mac & Cheese (beer & smoked cheese bechamel, herb-cornflake crumble) and added bacon. It was as tasty as I remember. Not as cheesy-gooey as some mac & cheese but still flavorful. I don't have much of an appetite on hot & humid days, so I ate nearly half and had to take the rest home for lunch the next day. We enjoyed our beverages and food. The service was great. Our server was very upbeat & friendly. It was a tad noisy for us, but we're old! We'd go back.